Searching for scopes on e-bay led to an old Heathkit IO-1128 Vector Monitor. This unit was originally used for servicing early color TV receivers. It has a high voltage power and filament transformer, a 3RP1A CRT with socket, some pots and switches and not much else. I bought it cheap and got some of the basic parts that I needed for a breadboard. Pretty much everything else I could find in my junk-box. The transformer on the rear left has dual 120VAC primaries and dual 10VAC secondaries. I used one of the primaries as a primary and the other primary as a secondary with a bridge rectifier to supply +150VDC for the deflection amplifiers. The 10V secondaries were used for ±5V and ±10V supplies for the op amps and other electronics. To the right of that transformer is the HV plate and filament transformer from the Heath monitor. On the right, the CRT is mounted in the front panel from the monitor. The small green board just in front of the transformers is the low voltage power supply. In front of that is a copper colored board with a bunch of insulated standoffs mounted on it. Sort of a HV breadboard. On the left side of that board are the two deflection amplifiers and on the right is the blanking circuit. In front of the copper board are two proto-boards holding the vertical and horizontal amplifiers, plus the sweep and sync circuits. Here is a screen shot of the breadboard during the design phase. 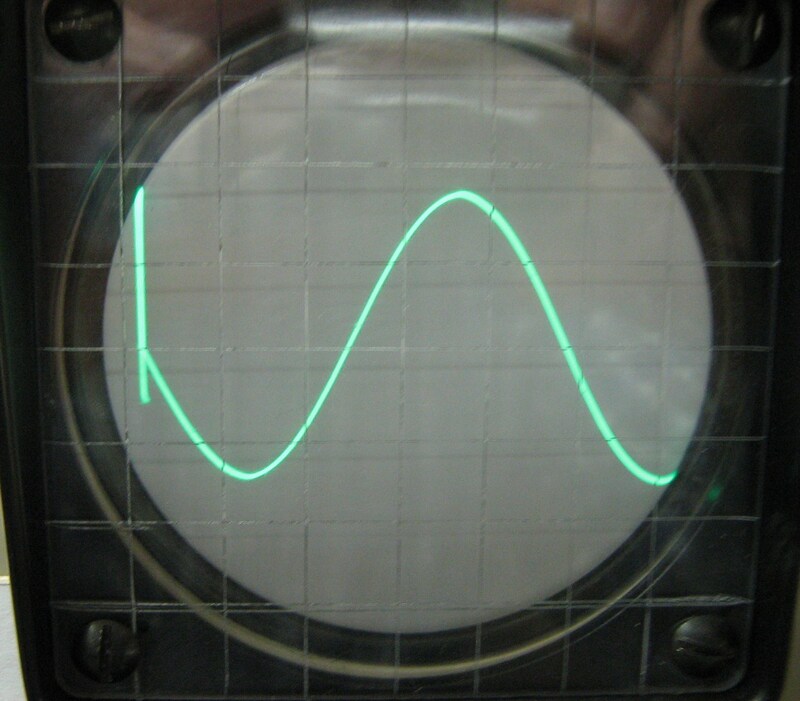 It is displaying a 1KHz sine wave. 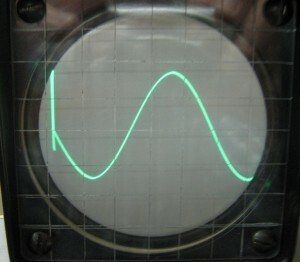 The triggered sweep is working but the blanking circuit is not yet complete. You can’t see the retrace lines (the retrace is very fast) but the bar on the left of the screen shows that the sync circuit is waiting for a trigger before launching a sweep. Yes, the CRT is not correctly aligned yet, so the waveform kind of runs downhill. 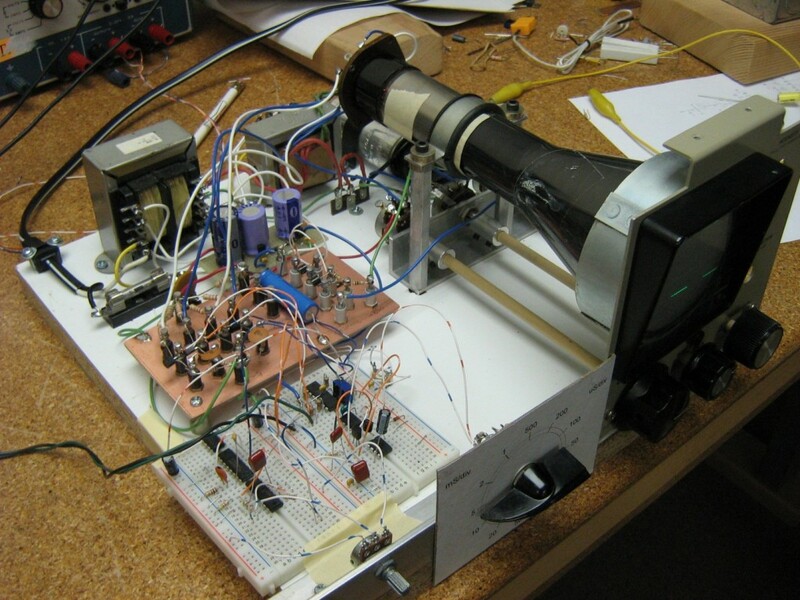 I always intended to make more than one copy of this scope, so I am planning to lay out a PC board with all the electronics and the power supply on board. This leaves only the CRT, AC power entry module, pots, switches and input jacks off board. In this way, I can use the same board for scopes with different package sizes and CRT types.